As team’s win the various championships around the country, LaxRecords.com will post available photos from the winner. Got a photo you’d like to submit? Reach out on Facebook, Twitter and Instagram or via email mloveday@laxrecords.com. Check out the entire list of 2016 champions, including runners-up and scores. Spain Park (Birmingham, Alabama) won its second consecutive Alabama state championship with an 11-10 win over Vestavia Hills (Alabama) on May 7. 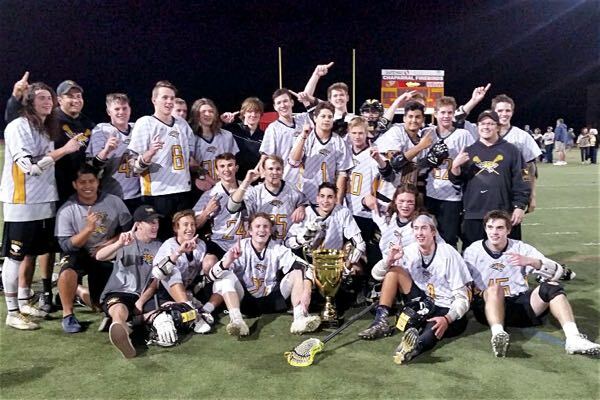 Gilbert (Arizona) got five goals from senior Gavin Crist, including the game-winner, to defeat Desert Vista (Phoenix) 10-9 in overtime to win the Arizona Lacrosse League championship on May 7. Gilbert jumped out to a 2-1 in the first five minutes, but Desert Vista, which won the 2015 title, roared back to make it 4-2 with five minutes left before halftime. Crist scored his third goal of the game to tie the score at 5-5 with 7:04 left in the third quarter. Gilbert eventually took the lead, but Desert Vista forced overtime with a goal in the final 10 seconds of regulation. Loyola-Los Angeles (Los Angeles) got for goals from Sean Smith in a 7-6 overtime win over Palos Verdes (Palos Verdes Estates, California) in the Los Angeles championship game on May 11. Smith scored the game winning goal in overtime. David Spencer had four assists and two goals to help Monte Vista (Danville, California) to a 14-6 win over De LaSalle (Concord, California) in the North Coast CIF Division I title. The Mustangs finished the year 22-1* to win the program’s fifth section title. Joey Piombo scored three goals in helping Monte Vista to a 4-0 lead in the first quarter. The game was tied at the half, but the Mustangs scored eight unanswered goals. Monte Vista was undefeated on the field as they forfeited their opening game of the year againsts North Coast CIF II champion Marin Catholic (Greenbrae, California) for unintentionally using an illegal player. Photo from Corona del Mar Twitter account. 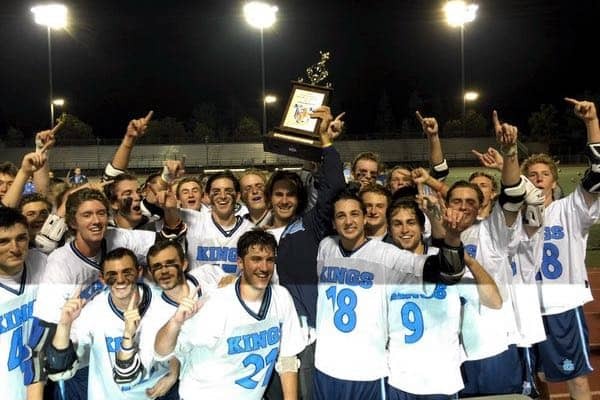 Corona del Mar (Newport Beach, California) defeated the 2015 Orange County champion St. Margaret’s Episcopal (San Juan Capistrano, California) 11-9 to win the 2016 title. The Sea Kings trailed by one goal (9-8) at the start of the fourth quarter, but the defense, led by goalie Nick Guizan, shut out the Tartans in the final frame. The win snapped a three-game playoff losing streak to the Tartans for the Sea Kings. Ryan Meckler was chosen as the game MVP for playing big on defense and scooping up four ground balls. Jason Simaan won 10 face offs. Jordan Greenhall and Will Favreau each scored four goals in the victory. Nick Shanks led St. Margaret’s with three goals. Poway (California) defeated Torrey Pines (Del Mar, California) 7-6 to win its second straight section title on May 21. The Titans scored the first three goals of the game and took a 5-2 lead into halftime. Sophomore goalie Kellan Cutting made 15 saves in the game, including a clutch save with 15 seconds left in the game. 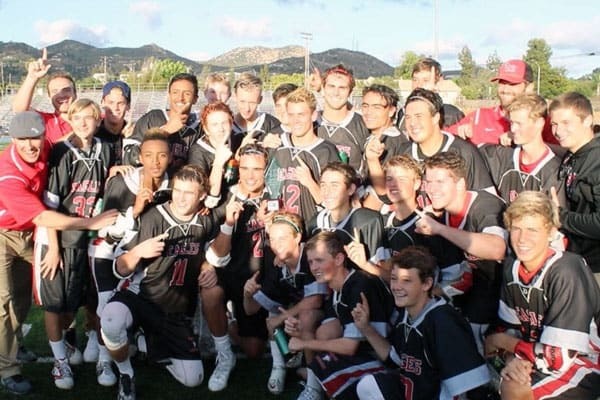 Santa Fe Christian (Solana Beach, California) defeated San Marcos (California) 6-5 to win its first section championship, in what was also their first title game appearance. Hank Ontiveros scored five goals and senior David Divjak scored the other goal for the Eagles. Santa Fe Christian finished the year with five straight wins. Ontiveros finished the year with 78 goals and 18 assists. St. Ignatius Prep (San Francisco) defeated Bellarmine Prep (San Jose, California) 12-9 on May 13 to win its seventh consecutive West Catholic Athletic League title. The Wildcats are undefeated in WCAL play and have won every league title since they joined the conference. 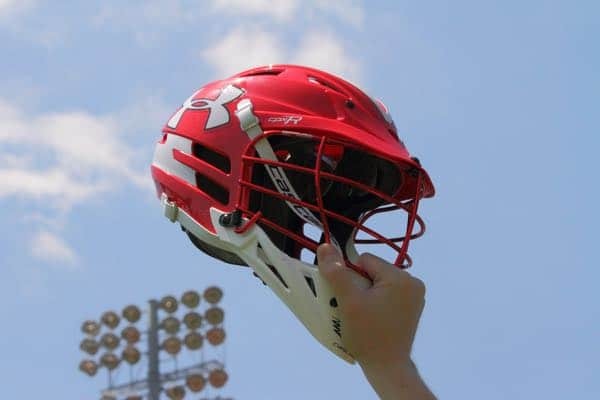 Regis Jesuit (Aurora, Colorado) defeated Arapahoe (Centennial, Colorado) 11-6 to give them their second championship in three years on May 20. Mikey Bealer scored three goals in the first quarter and Joey Chott scored three in the final three quarters to lead the Raiders to victory. Regis finished the season on an 11-game winning streak. Lance Tillman scored three goals to lead Valor Christian (Highlands Ranch, Colorado) to a 10-9 win over Dawson School (Lafayette, Colorado) on May 20. Gavyn Pure led Dawson School with five goals. Photo from Gonzaga Lacrosse Facebook page. 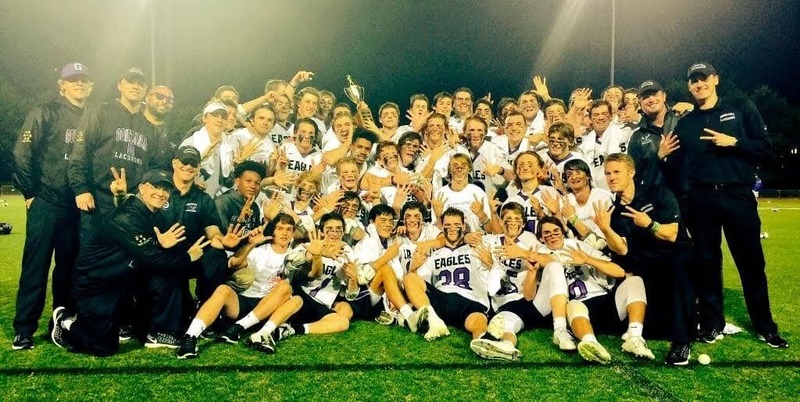 Gonzaga (Washington, D.C.) won its seventh straight Washington Catholic Athletic Conference championship with a 14-5 win over DeMatha (Hyattsville, Md.) on May 9. The Purple Eagles jumped out to a 7-1 lead in the first quarter and it never got close. Senior Avery Myers led the team with three goals and three assists while senior Mikey Stanton and sophomore Jack Myers each scored three goals. Jack Myers finished the year as Gonzaga’s leading scorer with 50 goals and 22 assists. This year’s team was balanced offensively, with five players scoring at least 20 goals Avery Myers was second on the team with 49 goals and Nick McEvoy was third with 37. Stanton finished the year with 37 goals. Senior Sam Offut scored 23 goals this year. Junior Brian Townsend led the team with 28 assists. Senior goalie George Christopher finished his final year with 149 saves. St. Thomas Aquinas (Ft. Lauderdale, Fla.) and Ponte Vedra (Ponte Vedra, Fla.) met in the FHSAA championship game on Saturday. The Raiders became the first team not named St. Andrew’s (Boca Raton, Fla.) or Lake Highland Prep (Orlando, Fla.) to win the state championship since 2002. The Raiders and Sharks entered the game with a combined 42-0 record, but it was STA that exited the game with Florida’s longest active win streak. Junior Kevin Crowley scored four goals, while senior Brennan Harhart scored three for St. Thomas Aquinas. The win is the first lacrosse championship for the Raiders, but becomes the 19th sport at the school to win an FHSAA title. Goalie Mikey Adler made 14 saves, including three in the fourth quarter. The title game appearance was the second straight for St. Thomas, which lost 13-11 to Lake Highland Prep last season. The Raiders had quite the run to the title. 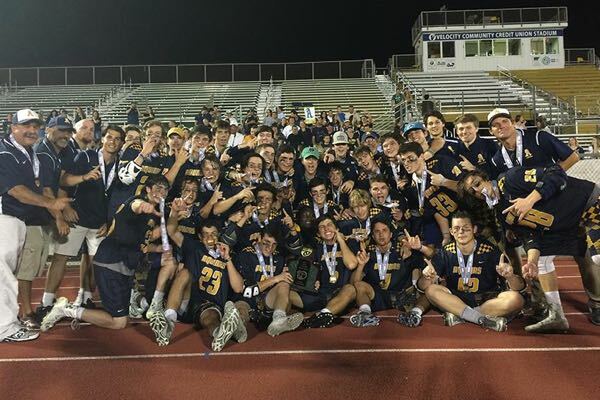 They played overtime games in two of their final four games, including a triple-overtime 11-10 win over Benjamin School (North Palm Beach, Fla.) on Friday. Clay Welch and Reid Smith each scored three goals for Ponte Vedra, which finished the year 23-1. Head coach Tom West won his 150th game at Ponte Vedra with the team’s semifinal win over Lake Highland Prep. Lambert (Suwanee, Georgia) defeated Lassiter (Marietta, Georgia) 6-3 to capture its third state championship in program history on May 14. The Longhorns capped an undefeated, 21-0, season with the win. Hayden Barnes scored the first goal of the game, just 46 seconds in, and Hunter Clem extended the lead to 2-0 before Matt O’Rourk to make it 3-0. The Longhorns took a 4-1 lead into halftime and the defense held Lassiter scoreless in the third quarter. O’Rourk led the team with three goals in the victory. Lambert’s defense allowed just 2.9 goals per game in the final nine games of the year and did not allow a team to score in double digits since they allowed 11 against Johns Creek (Georgia) on March 11. Lambert had four shutouts this season. 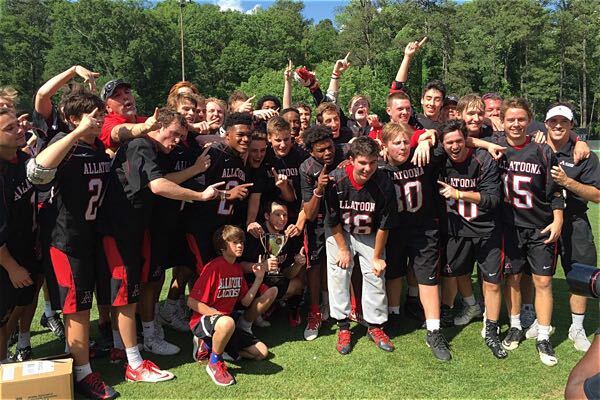 Allatoona (Acworth, Georgia) won its first state championship with a 9-7 win over Westminster (Atlanta) on May 14. The Buccaneers jumped out to a 3-0 lead with goals from Trevor Stuart, Carson Sorrells and Ben Galloway, but Westminster scored four unanswered goals to take a 5-4 lead in the third quarter. Undeterred, Allatoona took an 8-6 lead in the fourth quarter to cement the victory. 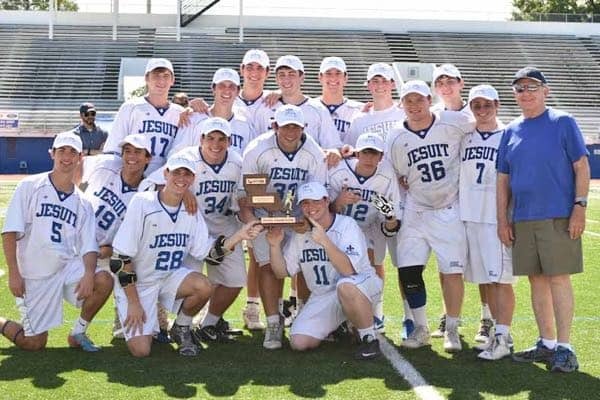 New Orleans Jesuit (New Orleans) won its fifth straight Louisiana High School Lacrosse League championship with a 15-6 win over Brother Martin (New Orleans) on April 24. The Bluejays held the Crusaders scoreless in the third quarter, led by Defensive MVP and senior goalie Rob Hinyub. Jesuit had a 9-4 lead at halftime and allowed just two goals in the fourth quarter. Hinyub was named the tournament’s Most Valuable Player on defense. Max Murret, the season scoring leader, was named the tournament’s MVP on offense. Bullis (Potomac, Maryland) finished the year as the IAC regular and tournament champions with a 9-5 win over St. Stephen’s & St. Agnes in the title game on May 22. Steven Schollenberger and NIcky Petkevich each scored three goals in the win. Petkevich finished the year with 62 goals to lead the team in scoring. Bullis won both the regular and tournament title, making it the first such achievement for the Bulldogs. McDonogh (Owings Mills, Maryland) defeated Boys’ Latin (Baltimore) 8-5 to win its first MIAA A Conference title since 2005 on May 20. Senior Sean Lanier made five saves, including two in the third quarter. Jason Sarro scored three goals in the win. Jack Parr and Jackson Morrill earned Co-MVP honors after combining for six points (one goal, two assists each). The championship is McDonogh’s third MIAA A Conference title and fourth conference title overall. The Eagles won the Maryland Scholastic Association (MSA) title in 1939. The Eagles went 11-0 in the conference, including the playoffs. Their only loss this year was an 8-7 loss to Bullis (Potomac, Maryland). Severna Park (Severna Park, Maryland) finished the year with a 17-game winning streak as they defeated Howard (Ellicott City, Maryland) 9-3 to win its sixth state championship in program history. The Falcons got two goals from Trevor Patschorke and Cian Chung to help the team to its first state title since 2010. Daniel Ross scored five goals to lead Linganore (Frederick, Maryland) to a 9-7 win over Mount Hebron (Ellicott City, Maryland) in the Class 3A/2A championship on May 24. The Lancers won their second state championship, their first since 2011 with the victory. Daniel Murphy scored two goals and sophomore Jordan Swoyer had two assists in the win. Ross finished his senior year with 58 goals and 31 assists. Murphy finished with 52 goals and 11 assists this season. Fallston (Maryland) jumped out to a 5-1 lead at halftime and added on in the second half to defeat Liberty (Eldersburg, Maryland) 12-5 on May 25. Junior Ben Claffee scored five goals and had two assists to lead the Cougars to their fifth title in program history. Sam Gold scored three goals in the victory. Hellgate (Missoula, Montana) defeated Bozeman (Montana) 19-3 to win its fifth straight state championship on May 22. The Knights have not lost a game to a Montana opponent since 2013 when they fell 14-13 to Polson (Montana). Cardinal Gibbons (Raleigh, North Carolina) finished the year on a 12 game winning streak and the NCHSAA Class 4A title with a 14-8 win over Lake Norman (Mooresville, North Carolina) on May 21. Mark Schachte led all players with four goals and helped the Crusaders jump out to an 8-0 lead. The victory was the Crusaders third consecutive championship. They won the Class 3A/2A/1A championship in each of the previous two seasons. 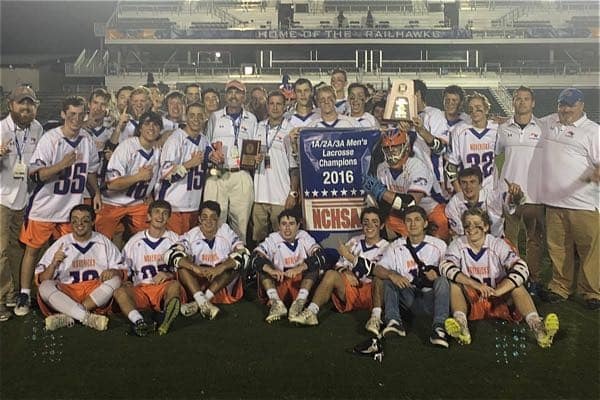 Marvin Ridge (Waxhaw, North Carolina) defeated Carrboro (North Carolina) 16-3 to win the Class 3A/2A/1A championship on May 20. The Mavericks were making their third-straight trip to the title game, but came out on top this time. Marvin Ridge jumped out to an 11-0 lead in the first half, led by sophomore Cam Renner who finished the game with five goals and four assists. Renner scored two goals in the first three minutes of the game. Kyle Atlas scored four goals and had two assists in the win. Coronado Red (Henderson, Nevada) defeated Faith Lutheran (Las Vegas) on May 13 to cap a 24-2 season. The Cougars defeated several out-of-state teams this year, including Eastside Catholic (Sammamish, Washington) and Lakeridge (Lake Oswego, Oregon). Coronado Blue (Henderson, Nevada) defeated Bishop Manogue (Reno, Nevada) on May 15. Santa Fe Prep (Santa Fe, New Mexico) capped a 16-1 season with a 3-2 win over Sandia Prep (Albuquerque) to win their third consecutive state championship on May 7. The Blue Griffins’ goalie, Danny Laposata, made four saves in the game and kept the team in it after falling behind 1-0 in the second quarter. Senior Gavyn Pendleton tied the game at 1-1 before halftime. Andrew McQuiston scored the go-ahead goal on the assist from Pema Baldwin in the third quarter. Baldwin scored Santa Fe Prep’s third goal of the game on an assist from Pendleton. St. Anthony’s (South Huntington, New York) got five goals from Thomas Heagerty in an 18-5 win over Chaminade (Mineola, New York) to win the CHSAA Championship. The win was the Friars first championship since 2012 when they defeated the Flyers 8-6. Jared Nugent had four goals and four assists in the win, which was the Friars fourth straight. Curtis (Staten Island, New York) defeated Tottenville (Staten Island, New York) 8-7 in overtime to win the PSAL championship on May 22. The championship is the first for the Warriors and it occurred in their first trip to the title game. Anthony Major scored the first two goals for the Warriors, which also got goals from Joshua Maye, Stein Wiesner, Zakariah Elhathat and Jens Wiesner. Curtis finished the year 22-1. Haverford School (Haverford, Pennsylvania) clinched its third Inter-Ac title in four years with a 13-6 win over Germantown Academy (Fort Washington, Pennsylvania) on May 10. Seniors Keyveat Postell and Dox Aitken each scored three goals in the win. The Fords finished the Inter-Ac regular season with a 10-0 record. 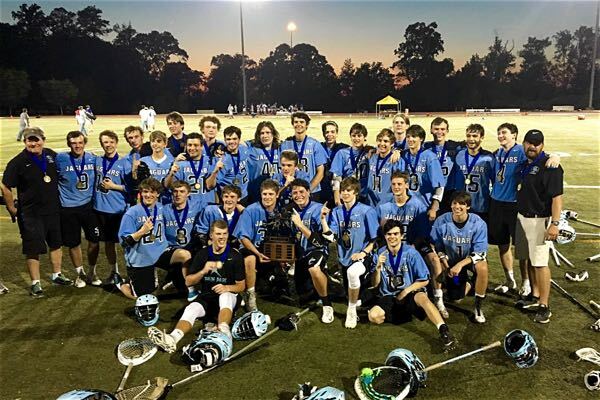 Memphis University School (Memphis, Tennessee) won its fifth state title in six years with a 12-6 win over Montgomery Bell Academy (Nashville, Tennessee) on May 21. Seniors Trammel Robinson and Winn Medlock led the way with five points each in the win. Robinson had four goals, one assist while Medlock finished with three goals and two assists. The Owls finished the year with a 15-game winning streak after starting the year 0-3. The defense allowed just one team to scored more than nine goals in those final 15 games after giving up 16 and 12 in two of their first three this season. Evangelical Christian (Cordova, Tennessee) defeated University School (Nashville, Tennessee) 17-10 to win the Division II title. Zach Genereaux scored five goals while Logan Saunders scored four and Logan Wenger scored three. 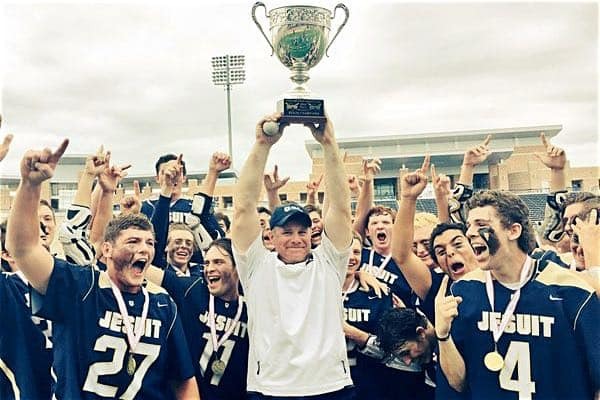 Dallas Jesuit (Dallas) defeated Highland Park (Dallas) 9-4 to win its first Texas High School Lacrosse League championship on May 15. The Rangers led 3-1 at halftime on the strength of goals from sophomores Grayson Hassell and David Sprock (Virginia). Senior Garrett Munck scored three goals in the championship victory. The Rangers finished the year with a 17-2 record and avenged an April 7 loss to Highland Park. They finish the season on a six-game winning streak. Dallas Jesuit reached the state championship game in 2011 and 2012. Colleyville (Texas) got two goals each from Madux Middaugh and Cale Dow in a 7-5 win over McKinney to win its first Texas state title. The Panthers took a 4-3 lead into the half, but junior Logan Smith knotted the game at 5-5 for McKinney with 8:20 left in the game. 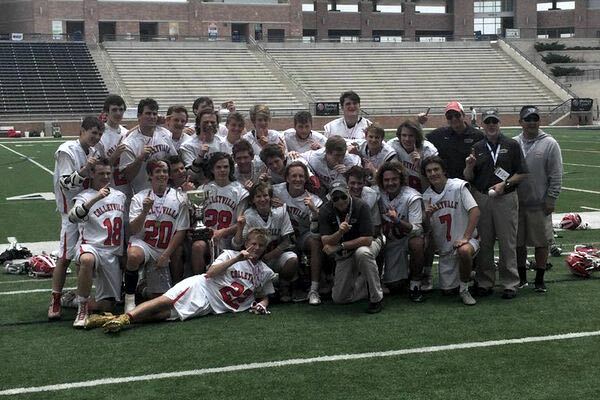 St. Stephen’s & St. Agnes (Alexandria, Virginia) won its fourth VISAA title in five years with a 12-7 win over St. Anne’s-Belfield (Charlottesville, Virginia) on May 21. The Saints were led by three seniors: Chase Goree (3 goals), Matthew Fisher (3) and Wade Shervin (4) in the championship win. The win was sweet for the Saints as it was the second-to-last game for head coach Andy Tabil who announced he will not return as head coach in 2017. The win also avenged a loss to STAB in last year’s VISAA quarterfinals. Bellevue won the 2016 Washington Division I championship. 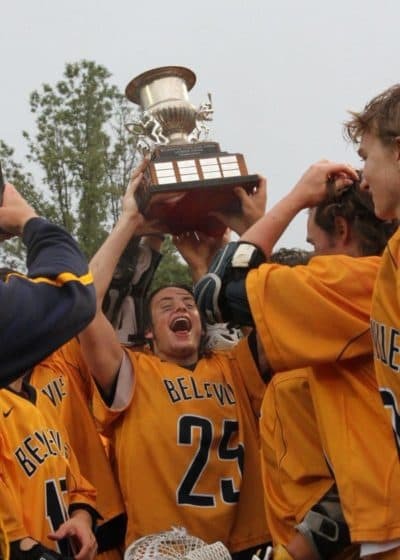 Maneuvering between groups of players hoisting the state trophy while others posed for team photos, Augie Fratt new in his heart the expectations that were on him and Bellevue High School entering Saturday afternoon’s Division I boys lacrosse championship game. He just didn’t know he’d have to wait until deep in the second half to realize them. For the Wolverines, it took nearly three quarters of patience and an untimely penalty by Crusaders goaltender Josh Matte, arguably one of the team’s their best players, to rally for its fourth boys state lacrosse title in five years with a 7 – 6 win before an estimated 3,900 at the Starfire Sport Complex in Tukwila. “We kind of expected to win after being on the other side last year,” said Fratt who has tasted both victory and defeat at the state championship level in his three years playing midfield for the Wolverines with titles now as a freshman and junior to his credit. After taking an early lead in the first on back-to-back goals by Matthew Marino and Fratt, Bellevue struggled to penetrate a strong zone defense set up by the Crusaders. With its defense holding court, Eastside Catholic went on to score four of the next five goals to take a 5 – 3 lead on a Jack Sercu score with 4:40 to go in the half and seemingly control the game. “We had to weight a long time for our opportunities,” said Fratt, who is more accustomed to dodging and shooting then moving the ball around the perimeter. But the Wolverines began to wrestle the game’s tempo back their way with Fratt connecting for his third of the night just 37 seconds later. The goal brought the Wolverines within one at the half, and would be the first of a run that saw Bellevue close out the game scoring four of the game’s final five scores. “They got their momentum at the end of the first half, said Crusaders senior All-Conference attackman Bryce Atwater, who finished with two goals and an assist for three points. While Joe Bethke’s game-tying goal at 8:09 of the third only stymied the Crusaders, it was a non-releasable penalty on Eastside Catholic goaltender Josh Matte for leveling a Wolverine player in front of the cage that gave Bellevue the final edge. The result was Matte, who had 13 saves in the contest, sitting out the next two minutes and a man-advantage goal by Fratt, his fourth of the night, with 6:19 to go that put the Wolverines in the lead for good. The win gave the Wolverines their 14th boys state lacrosse championship, 12 in Division I play, in 22 state title game appearances since 1979. Union is the 2016 Division II champion. 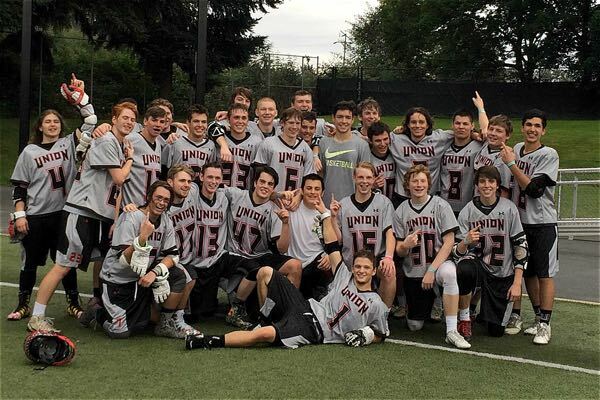 As the boys lacrosse season in Washington state drew to a close Andrew Harrah was sure his Union High School squad would be in the mix for its first state Division II title but it was the role that the Mountain View senior would play that was a surprise. So as the clock ticked down in the fourth, it was Harrah who found himself in the driver’s seat converting for the tying goal with just over three minutes to go, then again as he fired the game-winner past Richland’s Kyler Welch with just 42 seconds to go. It was the finishing touch on a Titans rally from behind for an 8 – 7 Division II state lacrosse championship, Saturday, at the Starfire Sports Complex in Tukwila. “It was a big fourth quarter for us,” said Harrah who finished with a game-high five goals, including four in the second half, as the Titans rallied form a 6 – 2 deficit with 2:36 to go in the third to score six of the last seven and set the stage for the first state lacrosse title for a Vancouver-area school. For Richland junior midfielder Jacob Ritchie it wasn’t necessarily a big change that he saw from Union or his own squad, just a shift in the flow of the game. Throughout the contest Titans goaltender Dominic Mendez, who finished with 12 saves – eight in the first, turned back a potent Richland attack led by All-Conference selection Vincent Sliva who had eight shots but only managed a single goal. Sliva shined with 12 ground balls, but went head-to-head with Mendez throughout the half, with Mendez holding the Mountain View junior to just a single goal and two assists, all in the first. “Dominic has always been big for us. He stood on his head today,” said Titans second year coach Tim Goodspeed.